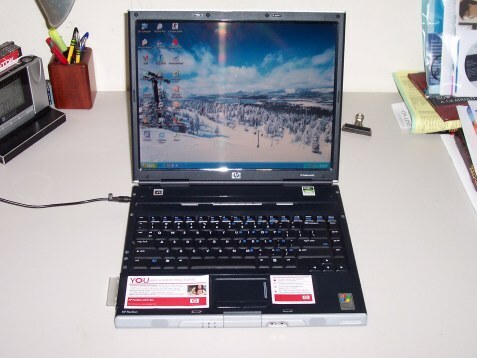 I bought this laptop in August of 2005 shortly before I began attending Mt.San Antonio College. 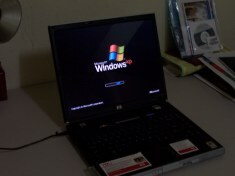 It is a Hewlett Packard Pavillion ZE-2113 that I got from Circuit City for around $840 after rebate. It is also my second AMD based computer since my 386. Don't let the on board graphics fool you though, other owners of this laptop says it's actually even good enough for gameing. I have Counter Strike on it which I have not played in a while but my friends may someday host another LAN party. I bought a cheap Logitech optical mouse to use with my laptop but it is now hooked up to the desktop after my original ball mouse died. 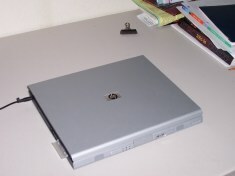 Another thing I bought to use with my laptop is a GE (Actually made by PQI) Intelligent Stick USB drive that I use for storeing my English essays and transfering files between this laptop and my desktop computer. Since my laptop also has 802.11G wireless access built in; I also bought a wireless router and print server so I could share the internet connection and printer with my main computer. 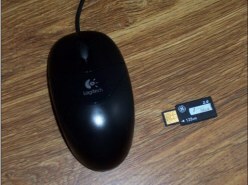 I find the built in wireless to be very useful as well. Mt. Sac has free wireless internet for students in the Library and student lounge. I use the internet on my laptop a lot there. I have Microsoft Office only on this computer so I mainly use it for typing English homework, but I also have some music and videos on it that I listen to or watch when I'm bored. It is also my only computer with access to a high speed connection so it is also used for downloading files too big for my previous 56K dial up connection at home. I haven't upgraded anything on this laptop yet but there are several improvements in mind. As I mentioned earlier, the on board graphics shares 128mb of ram so I have 384mb instead of 512mb. Although it seems ok for right now, I plan to upgrade the ram to 1gb. The 60gb Seagate hardrive would probably be upgraded to an 80gb Hitachi drive as it fills up. Hitachi makes laptop drives that spin at 7200 rpms vs the 4500rpm the Seagate runs which will allow programs to load faster. Battery life as of right now is a short 2 and 1/2 hours with the brightness up all the way but it isn't really a problem as I usually use AC power. An extended run battery pack is avaliable though.